A Claims Processor will decide if the insurance company has to pay a claim or not to the claimant. 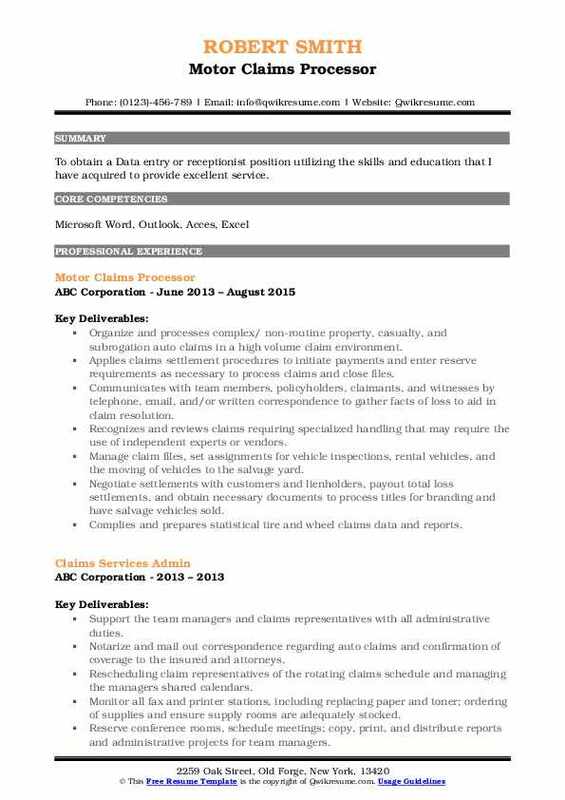 To carry out the process of checking and verifying, the Claims Processor Resume gives a list of certain associated duties such as – reviewing the insurance policy thoroughly to determine the kind of coverage, providing necessary guidance to claimants on how to file a claim, preparing claim forms and other paperwork, communicating with client to gather more information, escalating complicated or unusual claims to claims investigators, and performing other administrative tasks. 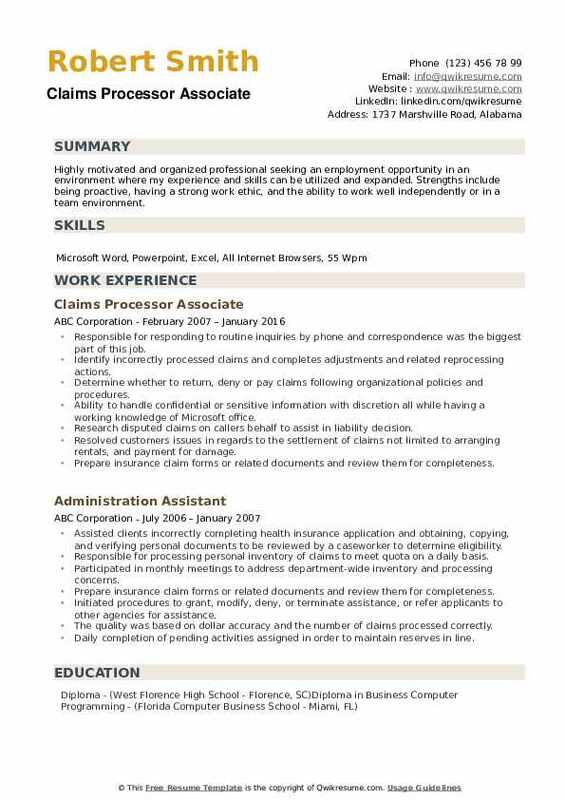 Specific job skills and attributes help the Claims Processors to succeed and such include – detail-oriented to understand complex paperwork, strong customer service skills and people skills, the ability to deal with frustrated and angry clients, and strong logic and reasoning skills to solve a variety of coverage-related issues. An extensive education may not be needed. A high school diploma is mandatory though. 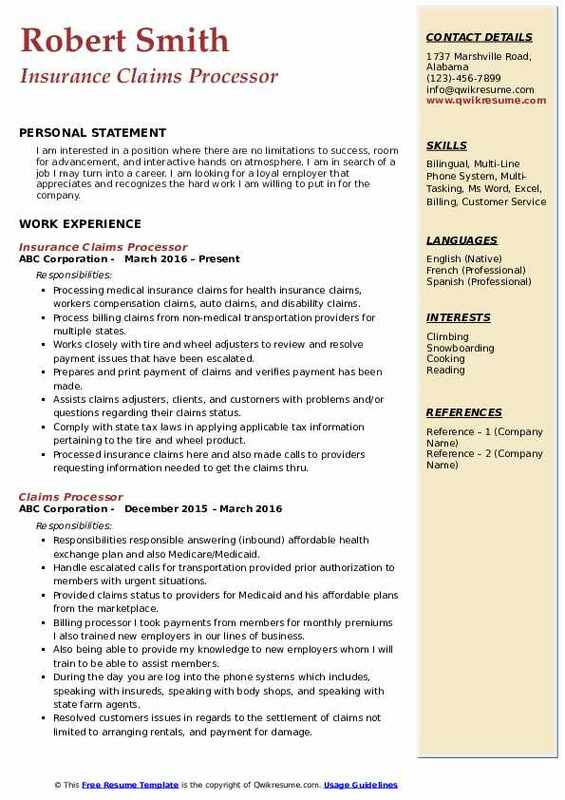 Objective : Dedicated insurance professional with more than 5 years of experience in claims processing, research, billing, and adjustments. Excel in analyzing account problem areas and its root causes, interpreting policies and processing case-sensitive decisions. Effectively manage high-priority projects and take pride in providing exemplary customer service. Reviewing claims working off project list or work queue. Maintain quality standards responsible to work suspended claims on a daily basis. Experience in a production based environment with an emphasis on quality outcomes. Reviewing and adjudicating medical claims in accordance with cms claim processing guidelines. Interface with other departments to obtain necessary information required for resolution of claims. Provided prompt customer support to members, providers, billing departments and other insurance agency's regarding claims, appeals and eligibility. Coordinated benefits while applying applicable deductibles, co-insurance and out of pocket costs. Evenly distributed pending spreadsheet amongst team to quickly focus on the closure or reassignment of claims. 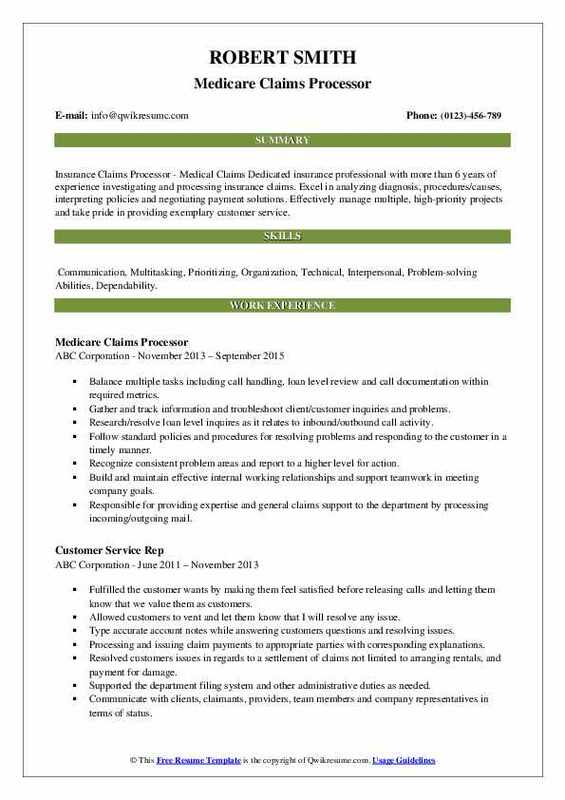 Objective : Insurance Claims Processor - Medical Claims Dedicated insurance professional with more than 6 years of experience investigating and processing insurance claims. Excel in analyzing diagnosis, procedures/causes, interpreting policies and negotiating payment solutions. Effectively manage multiple, high-priority projects and take pride in providing exemplary customer service. Skills : Communication, Multitasking, Prioritizing, Organization, Technical, Interpersonal, Problem-solving Abilities, Dependability. Balance multiple tasks including call handling, loan level review and call documentation within required metrics. Gather and track information and troubleshoot client/customer inquiries and problems. Research/resolve loan level inquires as it relates to inbound/outbound call activity. Follow standard policies and procedures for resolving problems and responding to the customer in a timely manner. Recognize consistent problem areas and report to a higher level for action. Build and maintain effective internal working relationships and support teamwork in meeting company goals. Responsible for providing expertise and general claims support to the department by processing incoming/outgoing mail. Utilize resources and prior experience in medical billing to determine if claims should be approved for payment or denied. Objective : Seeking a permanent and challenging position that matches my ambitious and motivated personality and uses my extensive experience to exceed professional expectations. Interpreted contracts with payers to ensure proper payment, sending initial or secondary bills to insurance companies. Process refunds/reinstatements/ rejections of insurance claims, running reports on a weekly and monthly basis. Reviewed patient accounts and resolved them to a zero balance by researching, and investigating all outcomes. Kept track of the inventory by reporting and sending weekly updates planned, prioritized, organized and completed work to meet established production goals or quotas. Created and maintained business relationships with our provider partners and payer clients. Resolved customers issues in regards to the settlement of claims not limited to arranging rentals, and payment for damage. Research disputed claims on callers behalf to assist in liability decision. Objective : To secure a position that will enable me to use my strong organizational skills, customer service background, and ability to work well with people in order to make a positive contribution to the company. Assisted indigent clients with completion of state and federal programs to help patient obtain and expedite benefit approval of hospital bill. Processed applications for different hospitals within an allotted turn around time. Input patient demographics and all proof of financials into the pace computer software. Assorted and prepared forms for copying, scanning to different agencies. Prepared disability applications for hand delivery to the social security office. Communicated well with co-workers, patients and families of all various educational and different backgrounds. Provided support to assistant manager, district manager, co-workers (including processing mail, call transfer, translating) professional, adhered to all phi and hipaa guidelines. Objective : Dedicated and focused administrative assistant who excels at prioritizing, completing multiple tasks simultaneously and following through to achieve project goals. Responsible for sorting and scanning incoming faxes and mail then filing the documents to the correct claim. Thoroughly review claims to ensure no missing or incomplete information. Possess extensive knowledge of medical terminology and how to read and assess medical documents. Process new insurance policies, modify existing claims and obtain information from policyholders to verify the accuracy of their claim and account. Responsible for printing, sorting, reviewing for accuracy, and mailing all outgoing daily mail. Possess excellent communication skills to converse with doctors offices or insurance companies if there is a problem with the claim. Communicate with clients, claimants, providers, team members and company representatives in terms of status. 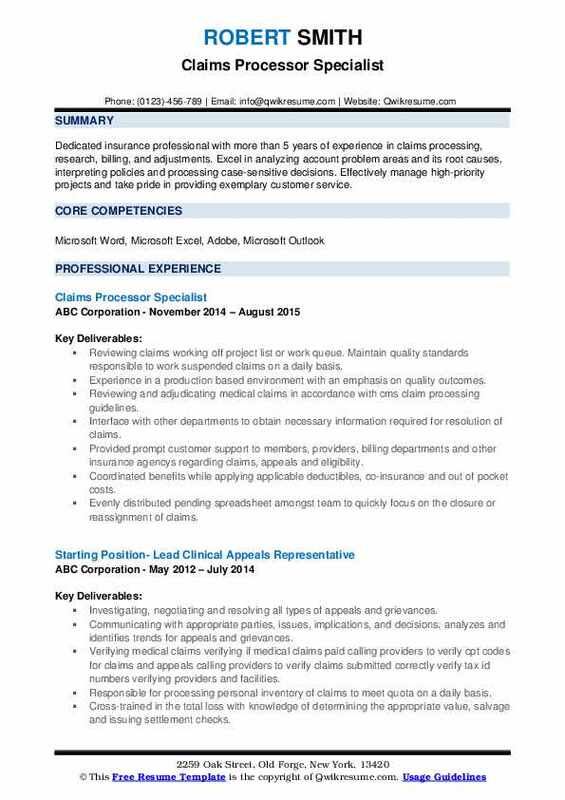 Objective : To obtain a Data entry or receptionist position utilizing the skills and education that I have acquired to provide excellent service. Organize and processes complex/ non-routine property, casualty, and subrogation auto claims in a high volume claim environment. Applies claims settlement procedures to initiate payments and enter reserve requirements as necessary to process claims and close files. Communicates with team members, policyholders, claimants, and witnesses by telephone, email, and/or written correspondence to gather facts of loss to aid in claim resolution. Recognizes and reviews claims requiring specialized handling that may require the use of independent experts or vendors. Manage claim files, set assignments for vehicle inspections, rental vehicles, and the moving of vehicles to the salvage yard. Negotiate settlements with customers and lienholders, payout total loss settlements, and obtain necessary documents to process titles for branding and have salvage vehicles sold. Complies and prepares statistical tire and wheel claims data and reports. Objective : I am interested in a position where there are no limitations to success, room for advancement, and interactive hands on atmosphere. 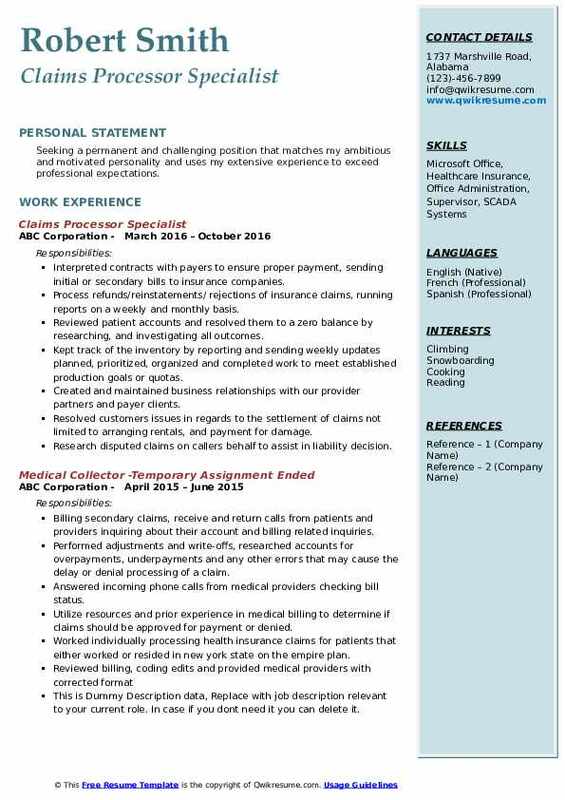 I am in search of a job I may turn into a career. I am looking for a loyal employer that appreciates and recognizes the hard work I am willing to put in for the company. Processing medical insurance claims for health insurance claims, worker's compensation claims, auto claims, and disability claims. Process billing claims from non-medical transportation providers for multiple states. Works closely with tire and wheel adjusters to review and resolve payment issues that have been escalated. Prepares and print payment of claims and verifies payment has been made. 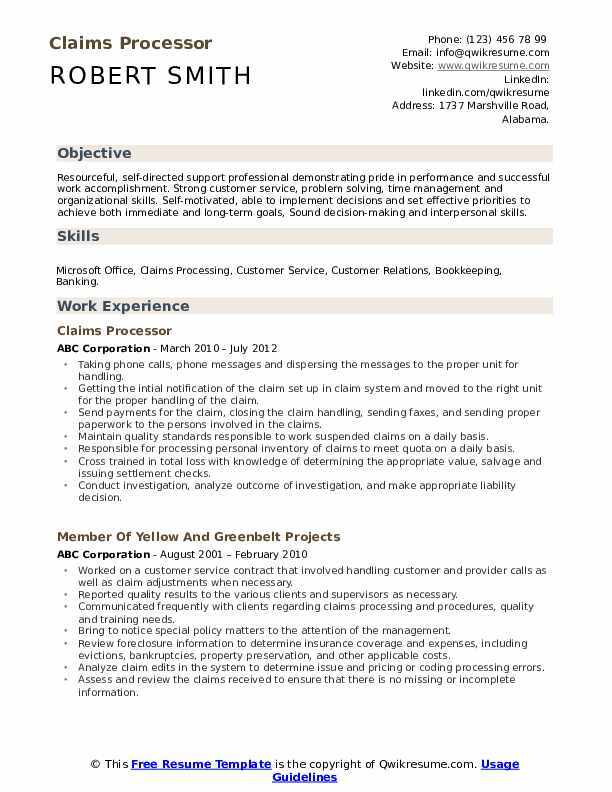 Assists claims adjusters, clients, and customers with problems and/or questions regarding their claims status. Comply with state tax laws in applying applicable tax information pertaining to the tire and wheel product. Processed insurance claims here and also made calls to providers requesting information needed to get the claims thru. 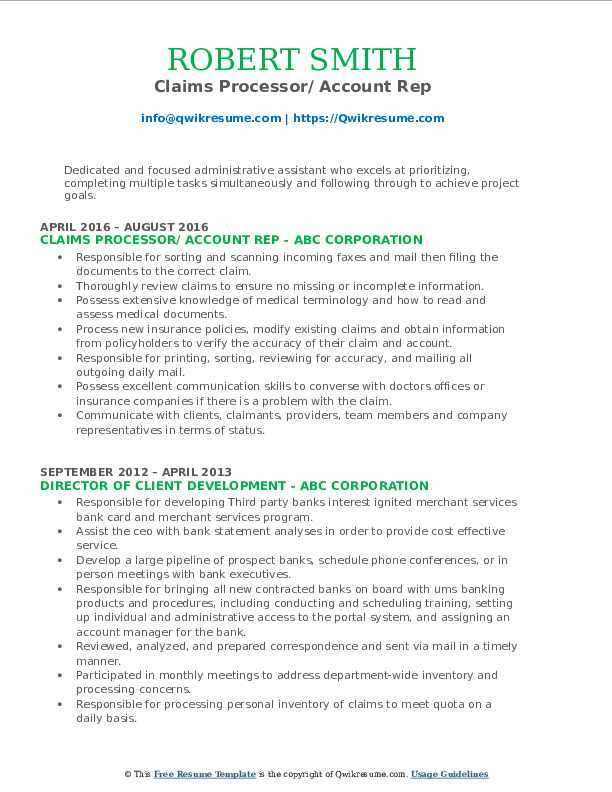 Summary : Highly motivated and organized professional seeking an employment opportunity in an environment where my experience and skills can be utilized and expanded. Strengths include being proactive, having a strong work ethic, and the ability to work well independently or in a team environment. Responsible for responding to routine inquiries by phone and correspondence was the biggest part of this job. Identify incorrectly processed claims and completes adjustments and related reprocessing actions. Determine whether to return, deny or pay claims following organizational policies and procedures. Ability to handle confidential or sensitive information with discretion all while having a working knowledge of Microsoft office. Summary : Resourceful, self-directed support professional demonstrating pride in performance and successful work accomplishment. Strong customer service, problem solving, time management and organizational skills. Self-motivated, able to implement decisions and set effective priorities to achieve both immediate and long-term goals, Sound decision-making and interpersonal skills. 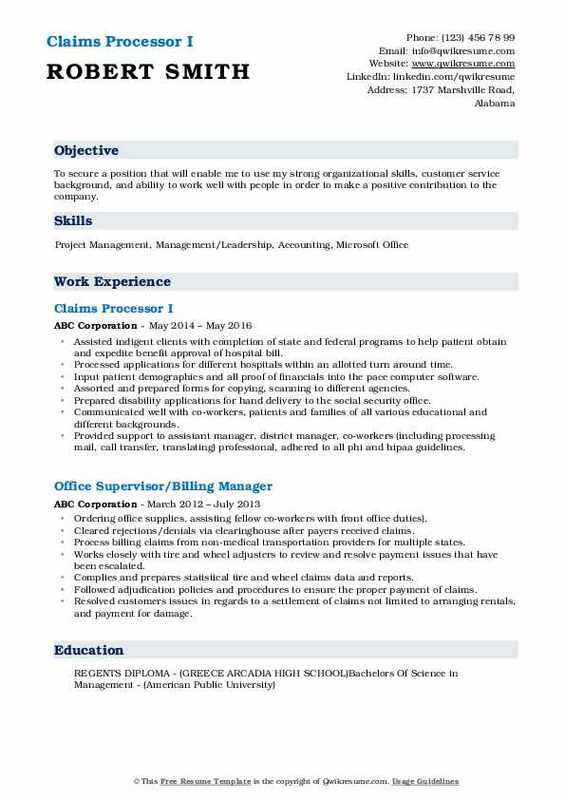 Skills : Microsoft Office, Claims Processing, Customer Service, Customer Relations, Bookkeeping, Banking. Taking phone calls, phone messages and dispersing the messages to the proper unit for handling. Getting the intial notification of the claim set up in claim system and moved to the right unit for the proper handling of the claim. Send payments for the claim, closing the claim handling, sending faxes, and sending proper paperwork to the persons involved in the claims. Maintain quality standards responsible to work suspended claims on a daily basis. Responsible for processing personal inventory of claims to meet quota on a daily basis. Cross trained in total loss with knowledge of determining the appropriate value, salvage and issuing settlement checks. Conduct investigation, analyze outcome of investigation, and make appropriate liability decision.